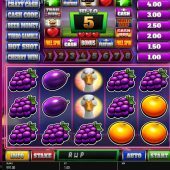 Ted Pub Fruit Series slot isn't what you may expect if you are familiar with the compensated cabinet 3-reel slots found in UK pubs and amusement arcades. It doesn't have 3 reels for a start and has pay lines and not just a single winning line. Obviously it's based on the franchised film theme the same as Blueprint's Ted slot with voice clips from our foul-mouthed and flatulent furry friend and some gentle bar-like background music to spin to. The reels are set in a cabinet as if it were in a pub and the board only becomes visible when the feature trail is triggered, so will Ted's Pub Fruit leave make our bankroll merry or will we leave hungover? The main grid is the standard 5 reels of 3 rows configuration with stacked symbols and no Wilds or scatters. 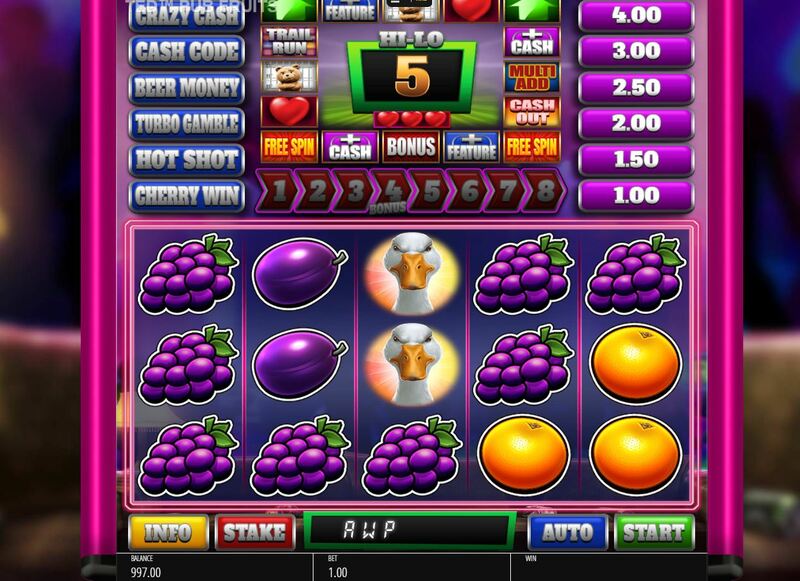 We have 5 paying lines with stacked icons though and the pays aren't bad at 50x bet for 5-of-a-kind Ted Logo, 25x Ted, 20x Duck, 10x Plum or Grapes with 5x for Orange, Lemon or Cherry. That's it for the reels, but some symbols are overlaid with numbers 1 to 4 and these are what we need to trigger the board game with its 16 different features and 3 hi-lo gamble modes. So, we need 9 or more positions to enter the game board. If you get to 4 on the trail there are modifiers such as Add Again, yes/no shots to add a single position to the trail and Stoppa which may randomly add positions or even land you on the cash ladder itself. Once we are there, the game transforms into the traditional Pub Fruit slot! So we have a feature ladder and a cash ladder to the left and right of the board respectively and you can gamble the hi-lo number reel to add to any of these. If not, simply press start to move around the lower trail to add extra life tokens, add to the ladders or raise to the higher trail. Of course, as with the Pub Fruits you can get killed at any time here by Ted, if you haven't earned an extra life. When you gamble the hi-lo and win, the reels spin to add wins to the Cash Pot which like the feature or cash ladders, you can collect any time. The top of both ladders is the Big Money feature which can pay a maximum of 1000x bet.